The ArtWrite Collective – Page 3 – Art for Equity. Art for Resiliency. Art for Justice. Join us at the Queer Summer Art Party and Fundraiser on June 19 at Jade Monkey for the release of our first summer queerzine READ THE ROOM. This zine is being released in conjunction with our art show up at Monona Public Library this June and July 2015. What does it mean to read a room? 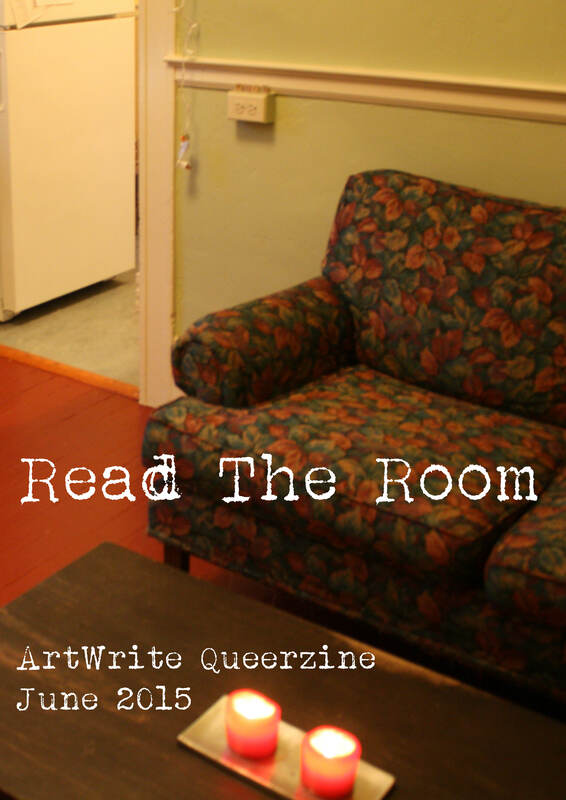 What does it mean to have a room read you? 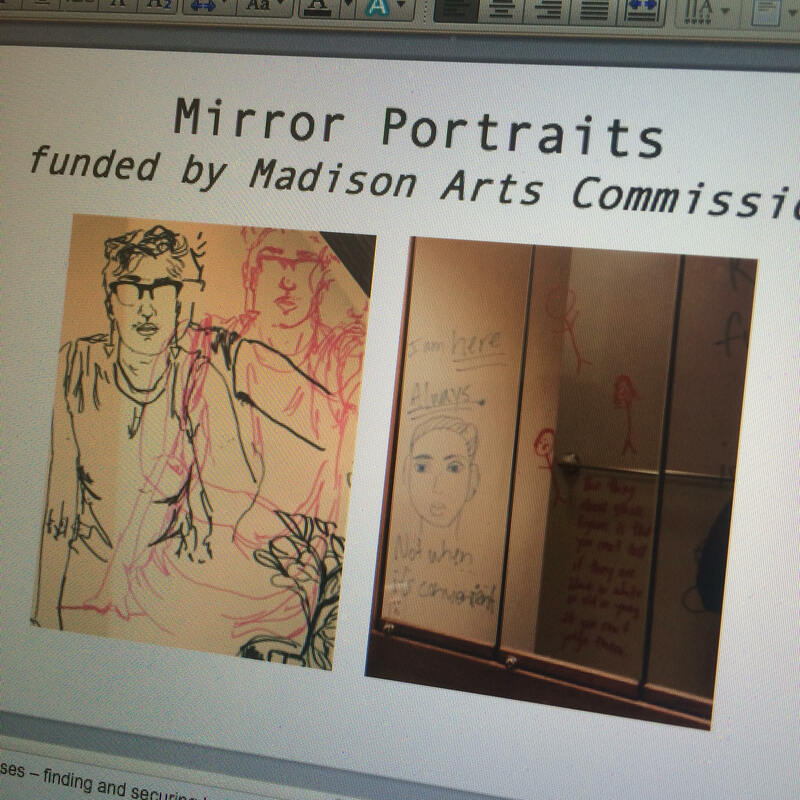 Mirror Portraits: BLINK Project Funded by Madison Arts Commission! 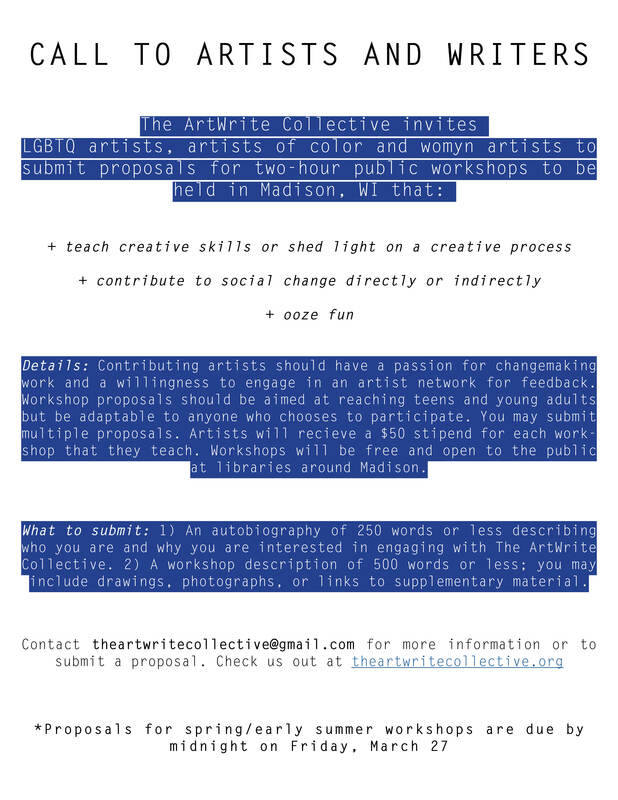 The Madison Arts Commission is sponsoring an upcoming public art project for The ArtWrite Collective! Keep an eye out for self-portraits drawn by members of our community popping up on mirrors throughout Madison; participating artists are exploring ideas of visibility/invisibility, displacement, and voice in the context of their own experiences. Artists hope to interrupt the daily routines of passersby with their portraits and stories. This is a BLINK project; expect the drawings with accompanying narratives to pop up in spaces one weekend in late June and then vanish within days. For the fifth year, runaway and homeless youth programs funded by the bureau were given the chance to win the materials to paint a mural in their facilities. A jury of bureau staff and young people from Los Angeles LGBT Center, last year’s winning agency, picked the winner and two finalists. A slideshow of murals can be found here. Briarpatch Youth Services’ transitional living cooperative, endearingly called GoldenEye, is a house for young people ages 18-22 years old who have aged out of foster care or experienced homelessness. This cooperative is a unique service preventing homelessness among young people in Dane County, Wisconsin. Briarpatch began partnering with The ArtWrite Collective in Fall 2014 to bring resiliency-nourishing arts programming to youth in this cooperative. Briarpatch youth are working with artists to plan zines, design stop motion animation videos, screen print, talk about issues that are important to them and have fun together. Members of the cooperative are interested in the idea of visibility or invisibility for the experiences of youth. “We Are Here” is the title of this mural design. 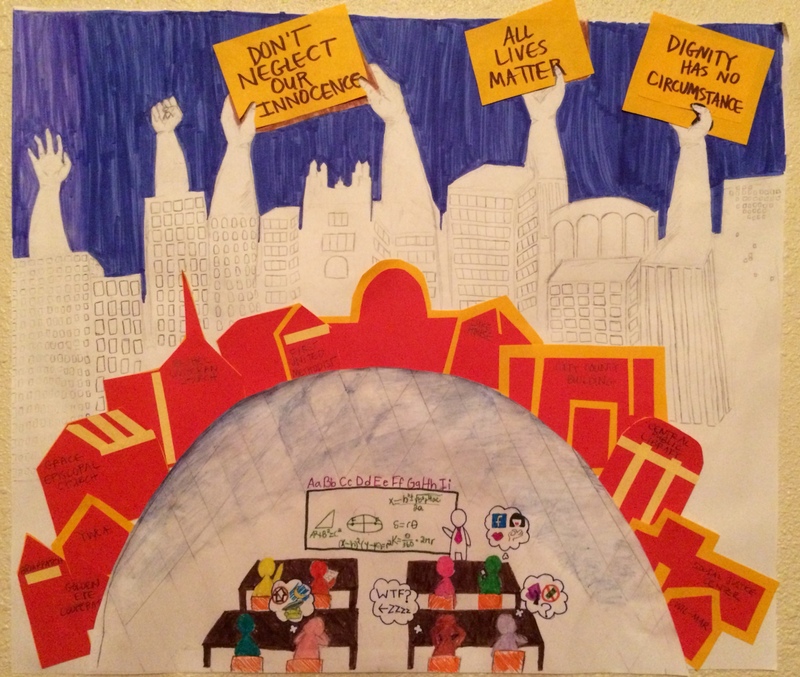 From the top down, you will see explicit demands, like “Don’t Neglect Our Innocence.” Next, we see hands rising out of the city skyline to represent young people on the streets and all over the city. The red and orange cutouts represent different services for homeless populations around Madison, WI. Under the red buildings, we see a glass dome. One of our members, Karena, played with ideas of an abstract landscape in which the dome was a close up of a classroom in Madison. Karena, “K”, “F”, Josh and other members of the cooperative want to show that not everyone is going through the same thing while sitting in school. While some are thinking about their crush, others might be thinking about where they are going to sleep or how they will pay for their cap and gown. In the final mural project, members of the cooperative would like to write positive messages around the edges of the mural about how Madison can better support the strong, resilient youth who make up the city. Multiple youth brainstormed themes for this mural and drew, glued or helped design this mixed media project. Members of the transitional living cooperative would like to invite younger people who are going through hard times to help paint this mural with them when the winter season lets up as a community outreach project that they lead. *It is important to note that this design was drafted before we were able to discuss the ramifications of language like “All Lives Matter” in the face of the hugely important movement for Black Lives Matter; while the teens’ intentions were to advocate for the intersecting experiences of all people, including youth of color experiencing housing insecurity, they have chosen to remove this language from any future iterations of the project to respect the unique significance of the phrase Black Lives Matter—there are more productive ways to indicate these intersections of identity and experience without co-opting the movement’s language. 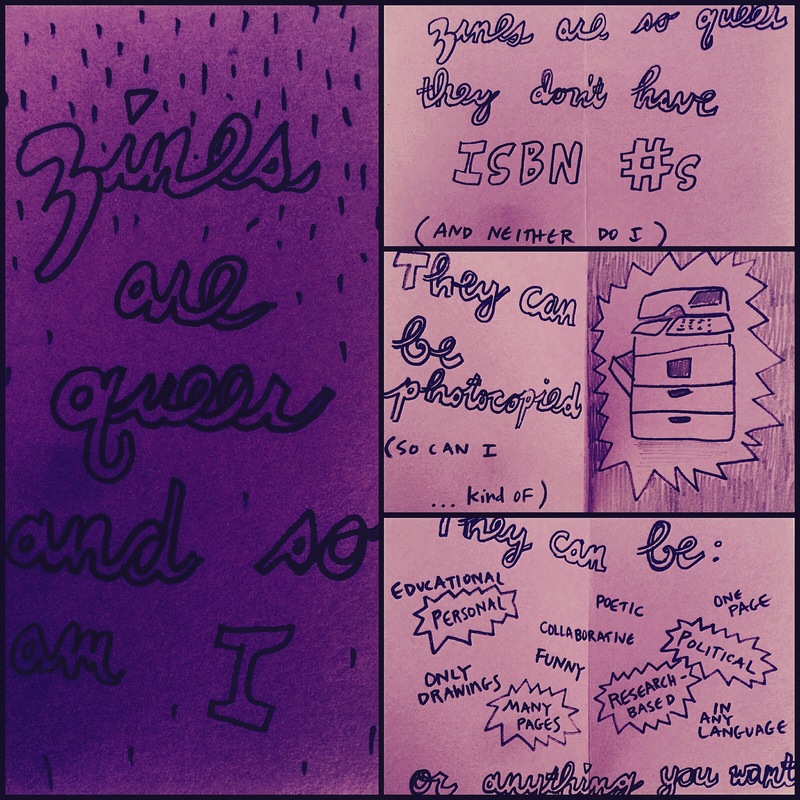 Whether you’re hoping to document a recent project, sketch out some comics, or tear down patriarchy, zines are a simple way to independently publish your work. Zines (short for fanzines or mini magazines) can be full of politics, essays, poems, doodles, research, prose, cartoons, portraits, manifestos, or anything your brain can think up. Zines can be simply created using a single sheet of paper or complexly designed using computer programs and special binding stitches. These pamphlet-booklet-zine-creations can be created independently or collaboratively, within an hour or over multiple workshop sessions. Want to bring zine-making to your youth group or artist friends? Reach out and we’ll connect you with one of our pro zinesters. 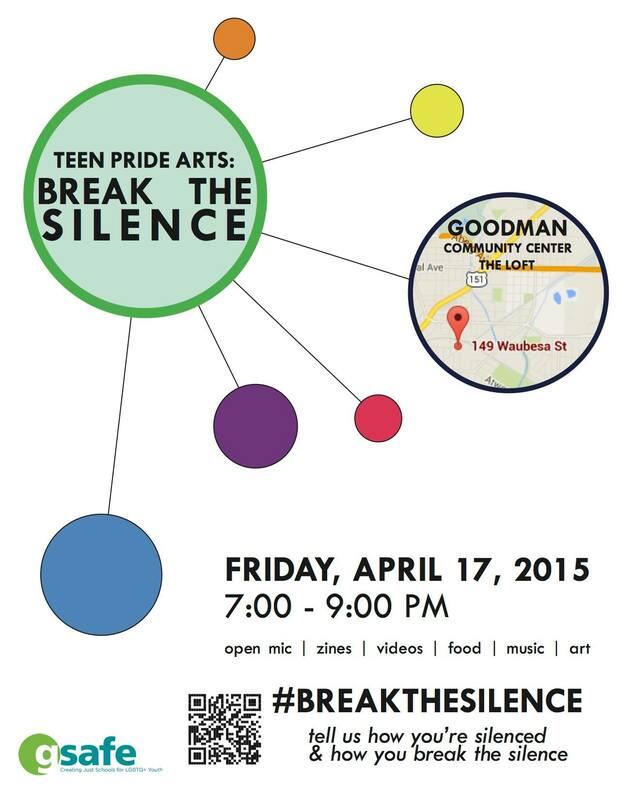 The ArtWrite Collective is co-hosting Teen Pride Arts: Break the Silence with GSAFE on April 17th at Goodman Community Center. We’re looking forward to a night of celebration to follow the day of silence. Show up for our open mic, some interactive art making, and fun! Our collective is committed to creative youth development, where young people are supported in sharing their voices and are seen as resources. We work with young folks who share from a deep place in the gut and who are courageous enough to share even when they are hurting. 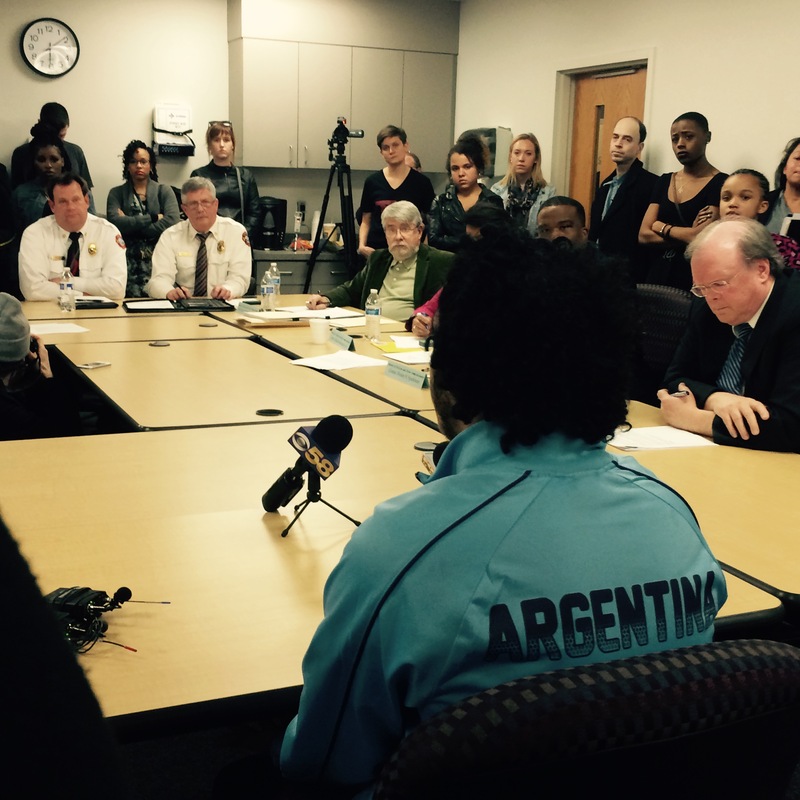 Two of these young folks told their piece at last night’s Police & Fire Commission, alongside many others. The room was packed, they were exhausted from a day of rallying, and they still showed up to leave it all out on the table. 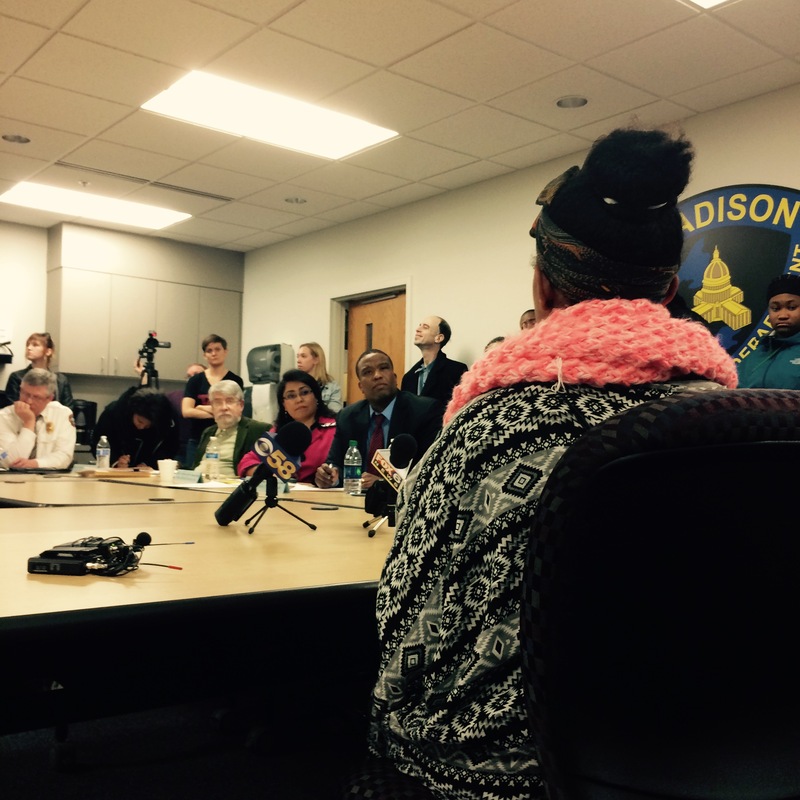 We are so, so proud of their bravery in response to Tony Robinson’s death. Wikimedia’s gender trouble is well-documented. In a 2011 survey, the Wikimedia Foundation found that less than 10% of its contributors identify as female. While the reasons for the gender gap are up for debate, the practical effect of this disparity, however, is not. Content is skewed by the lack of female participation. This represents an alarming absence in an increasingly important repository of shared knowledge. Let’s change that. 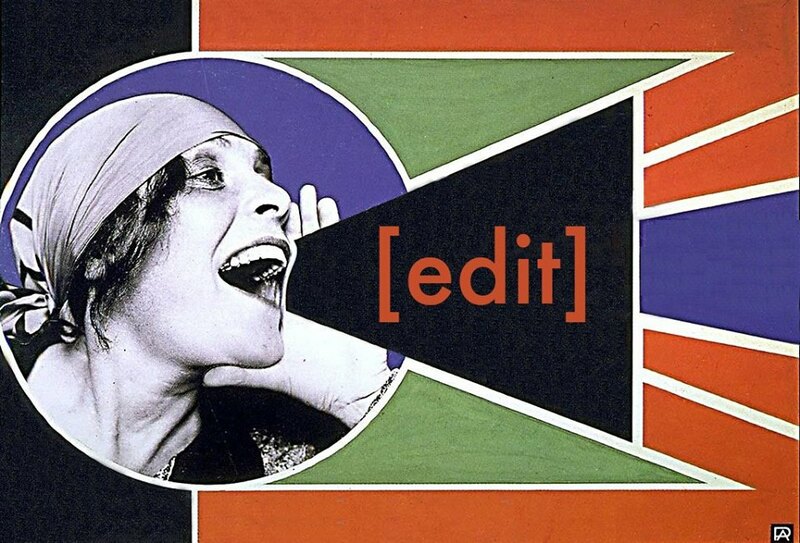 Attendees are encouraged to edit any entry of interest related to art, feminism, gender studies, and LGBTQ issues. All are welcome: women, womyn-identified, queer, and their allies. We will provide tutorials for the beginner Wikipedian and reference materials. Bring your laptop, power cord and ideas for entries that need updating or creation. For the editing-averse, we urge you to stop by to show your support. If you’d like to write, edit, or set up an account but don’t have a computer to bring, let us know and we’ll take care of the tech.